to forming structurally and emotionally expressive phrases as well as compositions. In the history of human culture, music happens to be the earliest fine art to be developed. Music has played an important role in the history of man kind throughout the world. It was an integral part of the lives of the people in every ancient civilization. It is also said that the culture of a nation is best described in music and allied fine arts. Available evidences confirm that each civilization had a great cultural heritage of its own and music was one of the in separable limbs of any culture. India is a land of music and music is an essential part of the life of her people. Since ancient times music has pervaded all facets of life-be it a social, cultural, religious or martial events. Music in India is as old as the about 2000 years. In India, music has been deemed to be of divine origin. Indian mythology has ample evidences of associating musical instruments with Gods and Goddesses. Particular references to musical instruments can be found in the great indian epics like Ramayana and Mahabharatha as well as the Puranas. Gods, Goddesses and other divine beings have been personified as music incarnate or described as delighting in music.In ancient times the role of music in India was mainly ritualistic. It was considered as a path to salvation. The growth of Indian music has been a gradual, continuous process of development from a very elementary stage. Today, it is been considered to be one of the most sophisticated melodic music system in the world of music. Indian music, like other kinds of art forms, has been handed down over hundreds of years with all the respect and love that a great heritage merits. There has been a very long evolution before our tradition achieved maturity and yielded variety. Indian music, being a very ancient art, has a very long, unbroken tradition behind it. The most distinctive characteristic of Indian music is that it is purely melodic where as music of west is Harmonic. Melody denotes a succession of notes and tones systematically arranged so as to produce a pleasing effect. the later centuries, due to various reasons, the classical music of India, though one in the spirit, has developed along two separate lines-Carnatic and Hindusthani. The difference between these two forms of classical music is mainly stylistic. There have been historical, political and cultural events that have influenced Hindusthani music to evolve a separate style of its own. Hindusthani music was influenced and developed due to the influx of the Muslim invaders from 12th century onwards. But the south, not very much a prey to Islamic culture, kept up and developed the original traditional style. Carnatic music is considered to be one of the most advanced and sophisticated classical music systems in the world today. The soul of Carnatic music is its Gamakas ( Unique oscillations) & Improvisation'. It has over 20000 scales called Raga, and innumerable Talas ( cycle of rhythm beats). Countless composers, enriched Carnatic music with innumerable compositions varying in the form, Raga and Thala. Since then a large number of musicians of high caliber-both instrumentalists and vocalists emerged and enriched the great heritage of Carnatic music and took the music to great heights, thereby securing a highly reputed place for Carnatic music at the international level. Today it has stood out as one of the most advanced systems of music in the world.The growth and development of Carnatic music through the centuries is a testimony to the greatness of the musical mind. Carnatic music is full of improvisation. It is at once ancient, traditional and also always new. It is both imitative and creative. The genius of Carnatic music lies in its 'Manodharma Sangeetha' ( Spontaneous exposition). 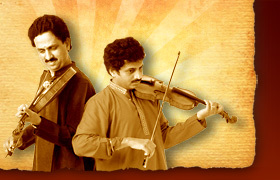 In a traditional Carnatic classical music concert, more than two-thirds of the duration is devoted to ' improvisation.'. Here, every musician is an interpreter as well as an embodiment of style. He has a freedom of expression all his own, though the degree of freedom allowed varies depending his role, the form and purpose. The violin came into India in its present form as early as the 17th century and Baluswami Dikshitar was the one of the earliest Indian musicians to adapt the western violin and popularise its use in Karnatic Music. It is a relatively new entrant in Hindustani music having probably been here for the past 100 years. The Indian violin is identical to the Western violin but differs from it in tuning and playing position. It is traditionally played in a seated posture, and is held in position with the scroll placed on the artist's ankle and the back of the violin resting on the left shoulder and collar bone or chest. This frees the performer's left hand to play Indian musical ornamentation such as the gamaka. The Indian violin is an important solo instrument, and in South Indian music it is very popular both as a Solo & accompanying instrument. Tuning the instrument differs depending upon the type of the music played on it. In traditional Western Classical music the tuning is standardised to the notes E A D G. It is tuned at intervals of a fifth to set it in vibration, thereby making it capable of greater flexibility in range, tone and dynamics. In the Middle East Classical system, Morrocans use the normal E A D G tuning, while the Turks use the D A D G tuning. The Arabs use D G D G and the Italians use all three. In indian classical music, the violin strings are tuned to, Dominant Pa, Tonic Sa, Dominant Pa octave lower and Tonic Sa octave lower. The tonic is variable in pitch.It could be the other way too Sa Pa Sa Pa from the 1st to the 4th string again with the tonic being variable in pitch.